A lot of people have been asking me about the symbols in the backdrop design I made for the Swedish band Ghost so here is a small guide to the images in it and how it was made. 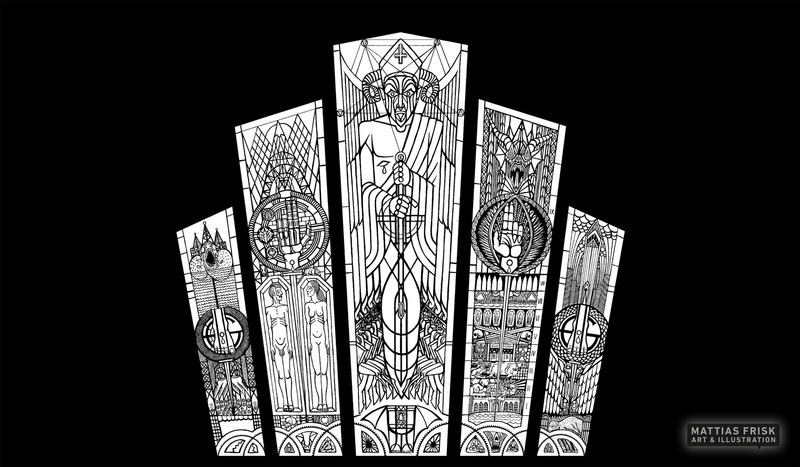 It should be based on an art deco window design with five windows. 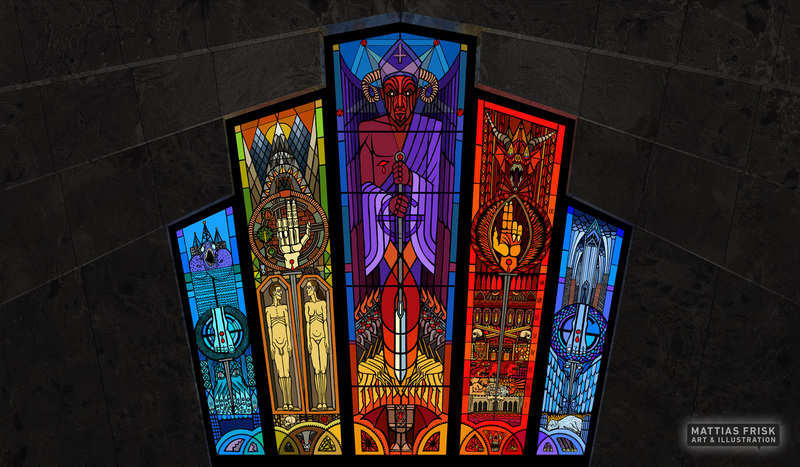 Satan should be in the middle. There should bee a reference to the five wounds of Christ and to Adam and Eve as well if possible. 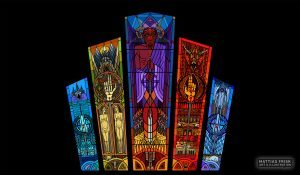 The clergy explained to me that I should think of the design as if being in a fancy office with these churchlike stained glass windows, so I decided to keep the design very modernistic and rely a lot on distinct form instead of making a romantic interpretation of the baroque, renaissance or medieval visual rhetoric’s. 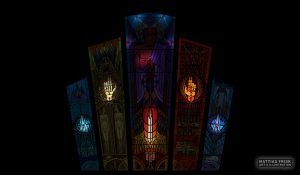 The silhouette of the windows made it quite tricky to keep a balance as a whole and even more inside each window. The shape of the windows were designed in CorelDraw ( I used to work a sign maker, we used CorelDraw for everything and I still think it’s so much faster than Illustrator). After printing the shape I started to work with pencils. When I was done I took a photo of the design and cleaned it up a bit in Photoshop and then colored the whole piece digitally. I then experimented a bit trying to remember how we marbleized papers back in elementary school and got some decent looking results. I scanned them and adjusted the colors and built the wall in Photoshop. 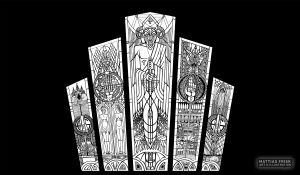 The overall design is based upon the five wounds of Christ accompanied by nails, and for the middle panels the lance of Longinus in the hands of our mighty lord Satan, bringer of light and destroyer of worlds. 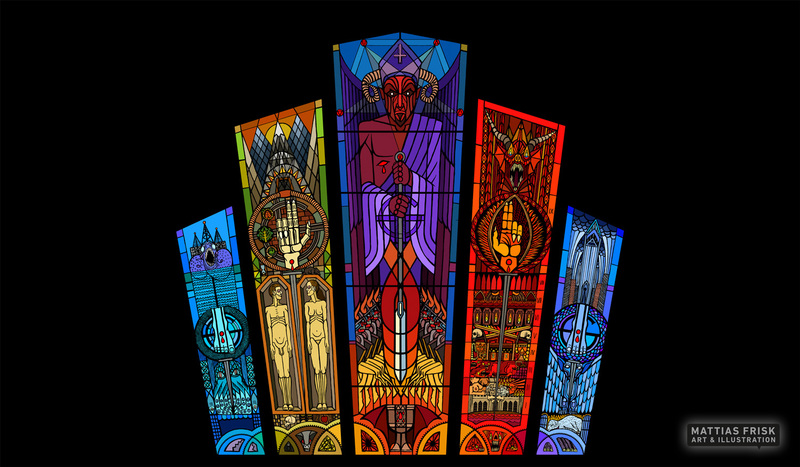 I decided to go with the five elements as an overall theme for the window, one element represented in each window, from left to right, water, earth, aether, fire and air (each nameless ghoul has been given an element so I thought that it was a good idea). Leviathan with an oil rig on his back that drills for oil at the bottom of the panel. In the middle of the panel there is a foot with a wound and below it a nail. Kraken and some (dead Jesus) fish. Sunset over the mountains and an entrance of a mine. The shapes also echoes skyscrapers and represent the dusk of civilization. Below is the sign of the Grucifix surrounded by a worm and a skeleton hand with a wound. A sprout and a fresh and a dead leaf represent the path towards death. To the left an hourglass with all sands at the bottom and to the right a rat and underneath Adam and Eve resting in their casket, divided by a nail. At the unlucky couples feet there is a skull an apple, a spider a rat and a snake. Satan in a purple robe, the color of emperors and kings. Each point of the pentagram halo has a sign that represent one of the elements. In His hands he holds the lance of Longinus that made the lethal wound in the side of Christ. 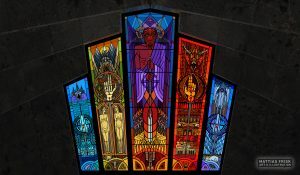 The lance is surrounded by a shape that both echoes a flame and a drop of blood, to the left and the right the armies of Pandæmonium and beneath them a Chalice. A dragon above an infernal mandorla that surrounds the left hand of a demon. Beneath the mandorla there is a nail and from the bottom of the panel to the top the nine circles of hell are represented. Smoke above chimneys and a skyscraper above the clouds. A foot with a wound and a nail under it and a bat above a sacrificial lamb upon a pyre flanked by two empty bird cages.